‘The punishment of some, the happiness of others,’ Nicolas Thienpont writes to sum up the experience of the 2017 growing season. If frost reduced the crop in St Emilion by 60%, it hides the fact that some properties were untouched, while others lost everything. A relatively precocious start to the growing season, with bud break a week earlier than previous years, didn’t help. This left the vines exposed to frost when it arrived. The terroirs on the plateau or on the south facing slopes of St Emilion which includes Pavie Macquin, Larcis Ducasse and Beauséjour hDL, were all largely spared, but on the Thienpont owned properties in Francs and Castillon it is a different story. No white Château Charmes Godard has been produced this year, and production at Château Puygueraud was frost affected. Overall there are smaller volumes and, for the red, there is a larger proportion of Cabernet Franc and Malbec in the blend. The white varieties at Puygueraud were badly hit volume wise but the wine looks brilliant to me. Château La Prade, also in Francs, was affected too as was Château Alcée in Castillon, with three of the five hectares subject to frost. So across the portfolio four properties affected, three spared. After the frost, for those vineyards undamaged flowering occurred in good conditions. This allowed for even fruit set. The summer was dry without being hot. There was some humidity and veraison was quick. There was rain in September, but the Thienpont’s report that the fruit was phenolically ripe and the acidities fresh. They see the 2017s as fairly classical wines, in which phenolic and technical ripeness coincided nicely. Certainly there is plenty of vitality and purity in the wines here this year. While they aren’t in the league of the 2015–2016 duo, these are wines of impressive harmony and finesse. 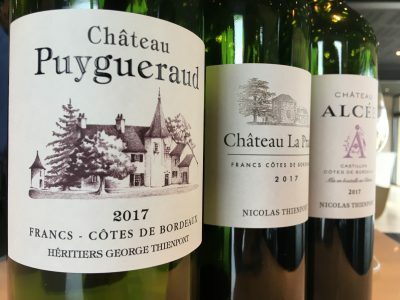 You can’t beat Château Puygueraud for value. Both red and white versions deliver bang for your buck. The white wine, made in much smaller quantities than usual, is very impressive. Château La Prade has attractive, plump fruit and Château Alcée has finesse, if it lacks a little middle this year. 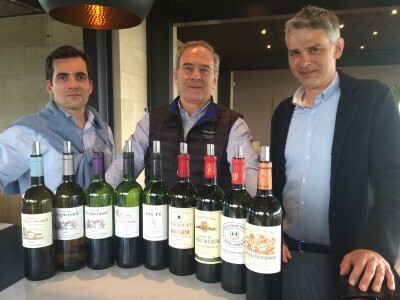 Château Larcis Ducasse shows wonderful purity as you would expect with an exciting texture but Château Pavie Macquin steals the show with a powerful wine in 2017. It is savoury and full. 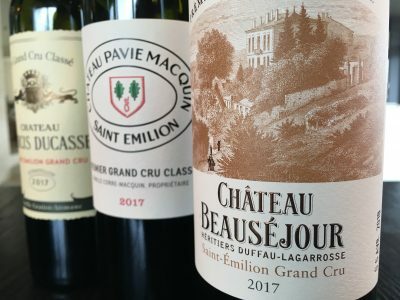 Château Beauséjour dHL is excellent. It exhibits terrific purity and great length.